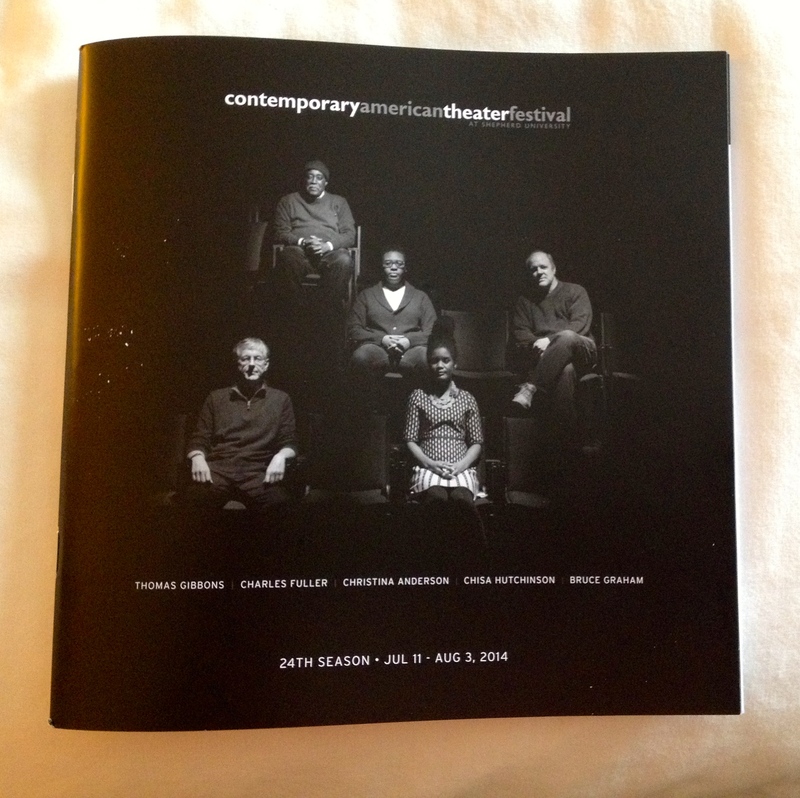 Last night was opening night of the 24th annual Contemporary American Theater Festival. My wife and I are here for our third year. See my blog post of July 14, 2012; sadly, I got either swamped or lazy and neglected to write up the three plays we saw here last year. Suffice to say they were good enough to bring us back and establish a tradition for us. If you don’t know of the Festival, check out the CATF website. Hosted by Shepherd University in Shepherdstown, WV, it sets out to produce and develop new American theatre, and its core values are “to sustain an artistic process of innovation and daring, to tell diverse stories, to create a profound and ever-evolving relationship between the audience and the work.” Pretty impressive goals, and they make it hard to stay away. This year, we re-upped for all five new plays. 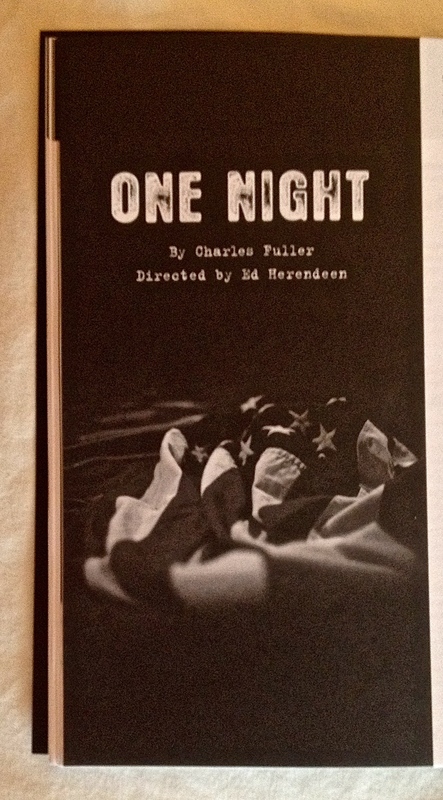 I was particularly eager to see Charles Fuller’s newest play, One Night. I remember years ago seeing his A Soldier’s Play, which won a Pulitzer Prize back in 1982, and was subsequently made into the award-winning film, A Soldier’s Story. So I had high expectations of this new one. One Night had played last Fall at the Cherry Lane in New York, but Mr. Fuller is clearly not finished with it, continuing to make further revisions and try out new ideas. Fuller himself was present in last night’s audience. He is a gentle giant of a black man, who deals brutally and honestly with the evils of racism, and who is utterly dismayed by our human capacity to invent cogent “reasons” to harm each other. We “good guys” have found ways to accept the necessity of war, otherwise known as the legitimized mass murder of individuals who have no need to harm each other were it not for the demands of “God” or country. We have accepted radical racism as being justified by “fear of what’s different,” or by self defense … even when no perceived threat is actually present. We have accepted post-traumatic stress disorder as a fact of life, lashing out at each other in the form of rapes, serial murders, and mass shootings. And on it goes. These are the themes Mr. Fuller tackles in One Night. No easy task! It’s the story of Alicia, an Army sergeant brutally raped by three men while serving in “the sandbox,” as the Iraq theatre of operations was called. In a seedy motel room following her discharge, she tries to stitch her life back together with a questionable fellow vet. Seeking ordinary victim justice has proven fruitless. She finds herself plagued by flashbacks, accused of setting a fire she can’t remember, and harassed by the motel pimp, the police and the fire department. There are a lot of angles to follow through, and the script seems cluttered by unnecessary complications. I wasn’t sure just why the pimp even needed to be here. Worse, it took a long time to uncover a nonessential mystery I hadn’t even realized was a part of the play. The combination of too much and too little information prevented any real suspense or climactic impact, and the last few scenes in the play seemed to disintegrate into hopeless cliché, as if rushed to meet production deadlines … which in this case, could not have been so. However, the complicated process of making a play takes seeing, and revising, and discussion, and testing, and response. And process is largely what this Festival is for. I already know from his other work that Mr. Fuller is a craftsman, and I have little doubt he’ll continue to develop the work into a very dramatic piece on an urgent theme. Or instead, … he could listen to the enthusiastic endorsement of the young man who sat next to me before this afternoon’s matinee: “Hey, wasn’t last night’s play intense, awesome, deep, perfect?” … and choose not to change a thing. Such is the nature of theatre. This entry was posted in Theatre and tagged A Soldier's Play, A Soldier's Story, CATF, Charles Fuller, Contemporary American Drama, post-traumatic stress syndrome, sexual assault in the military, Shepherdstown WV. Bookmark the permalink.